I suppose I’ll learn what to do with these. Trail Skills College seems like a logical step! Photo by Spencer Dykstra. I enjoy hiking, walking, and trail running at times. There are plenty of places to go with trails, paths, lakes and rivers all around the Sacramento area. It is a part of my routine, one way or the other. I get out for varying amounts of time, all based on what life allows. It is wonderful exercise and cheap therapy. Having worked for the PCTA for more than a year, jumping in with both feet, I often heard about looking with your “trail eyes.” What does that mean, I thought? When I asked my coworkers, they explained but recommended that I try attending Trails Skills College to really get it. Seemed like a logical step. 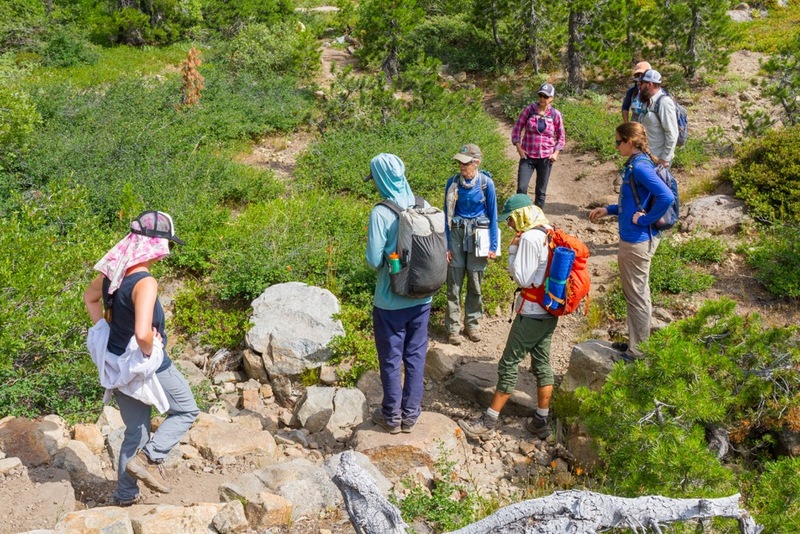 It’s a perfect opportunity, alongside other volunteers, to learn valuable trail maintenance skills. As employees, we are encouraged, when time permits, to participate in trail projects. Me and other Intro to Trail Maintenance classmates gather on Saturday morning. Photo by Spencer Dykstra. I anticipate the weekend and all the knowledge that would be mine. The day of, I arrive at the family camp area and watch as it fills with volunteers. My mind starts wandering, concerned about being exposed as the novice I am. Will my boots scream “I haven’t been used for work ever…look everyone! ?” Will I be able to put up the borrowed backpacking tent on my own? Had I thought through how awful it would be if people felt obligated to come over and help me put up a tent? Worse yet, what if it isn’t staked down well enough and during the evening it ends up in the lake? Maybe I should have brought our inexpensive, Walmart, six-person, family tent that I’ve put up and taken down for years! I notice I don’t have those real “work pants” either. I have name-brand, lightweight pants made for hiking. Even with the nagging thoughts, I don’t care too much. I am excited to see what this is all about. So this is what digging in the dirt looks like. Here’s me, left, with Michael and Jan, in all our glory. I’m curious about volunteers.Who are these people that love the trail so that much? 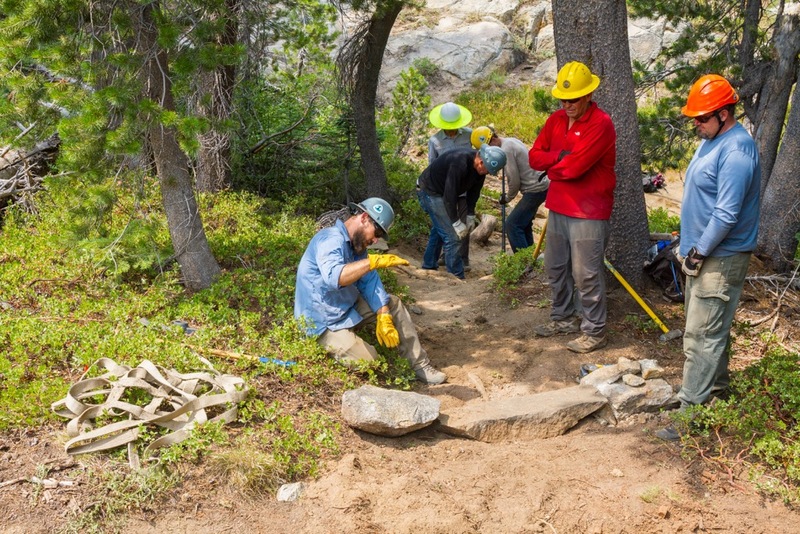 What REALLY is trail work, anyway? Saturday starts early with a big, delicious breakfast. Simply sticking out a plate is an excellent way to wake up in the morning. (Thank you, Roberta, camp cook extraordinaire!) We get in our small group, everyone who’s signed up for “100 Intro to Trail Maintenance” and get right at it. First, there’s the PPE (Personal Protective Equipment), then there’s some JHA (Job Hazard Analysis) talk, followed up with a TSS (Tailgate Safety Session) and EAP (Emergency Action Plan) discussion. I’m feeling pretty safe in every way, right about now. Then we learn the great enemies of the trail. First up, water run-off. Then there’s the “slough” that builds up on the inside of the trail and the “berm” on the outside. The ever-encroaching brush needs to be lopped back. Drainage features need to be in “tear-drop” shapes. The trail “bench” (the part we walk on) should be three feet wide and the trail “corridor” (the space our bodies pass through) should be six feet wide and eight feet high to accommodate pack stock! It’s time to work! We head up the trail learning, talking and sweating. Photo by Spencer Dkystra. These are lofty goals for us beginners. But it’s time to work! We head up the trail learning, talking and sweating. 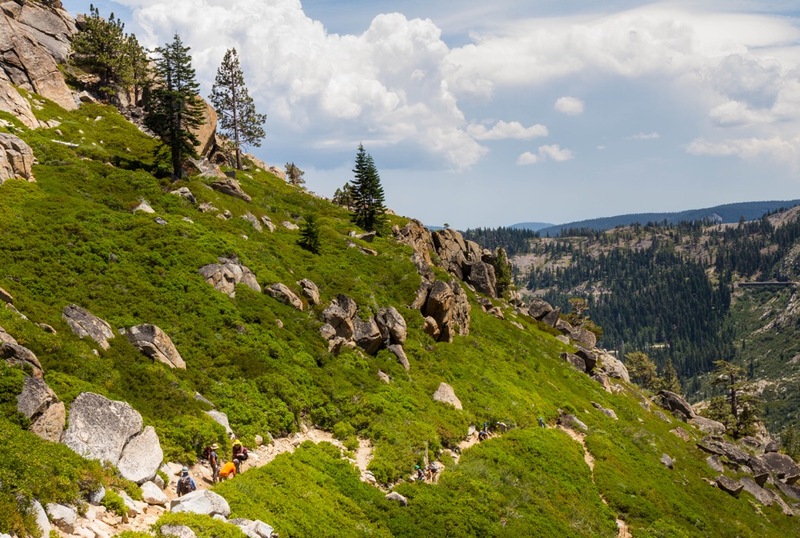 The trail is bustling with day hikers going to the lake at the top. The trail is crowded today. A great sharing of tools begins as we continue to climb and then, eventually, make our way slowly working down the path. It’s hot and dusty. There is no shortage of hard work to do. We are reminded that quality work is better than quantity and to always be safe. Just as the hikers went up, they are coming down. Normally, a crowd could be annoying. Not in this case! 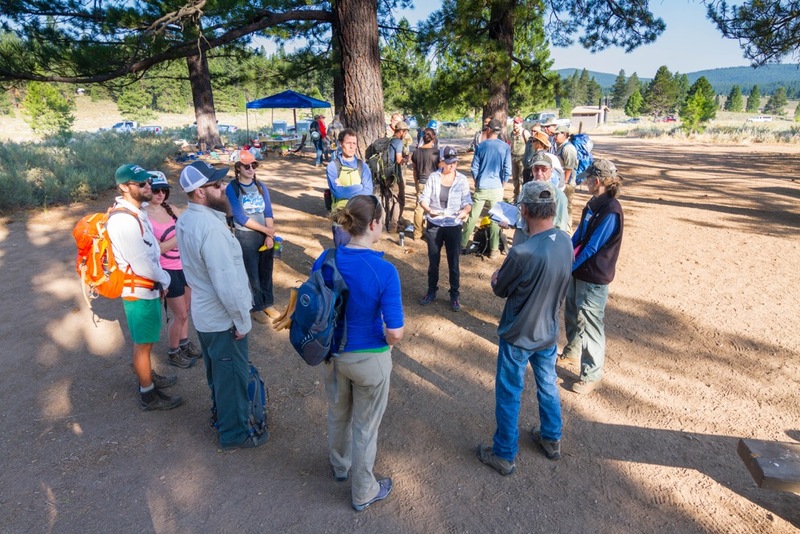 The hikers provided constant, frequent, much-needed breaks and even encouragement. Nearly every last hiker thanks us for our work. Hikers are a thankful bunch. On the trail our group has bonded over hard work, lively conversation and taking in large amounts of new information. We joke about going online when we get home to buy ourselves McLeods. I’m curious about volunteers. What REALLY is trail work, anyway? Photo by Spencer Dykstra. We spent Sunday in “Intro to Scouting and Adopting.” I am looking for trail work that needs to be attended to and record it based on what is most needed. Photo by Donna Cline. We’ve been taught well. So, this is what they meant by “trail eyes.” There is work right there, on both sides, above, behind and in front of me. Step, critique, step critique. The view is much different now. And while I’ll always love to hike if for nothing but the cheap therapy, I’ll never see the trail the same way again. I look forward to buying myself some of those real work pants and getting back out there with a McLeod. 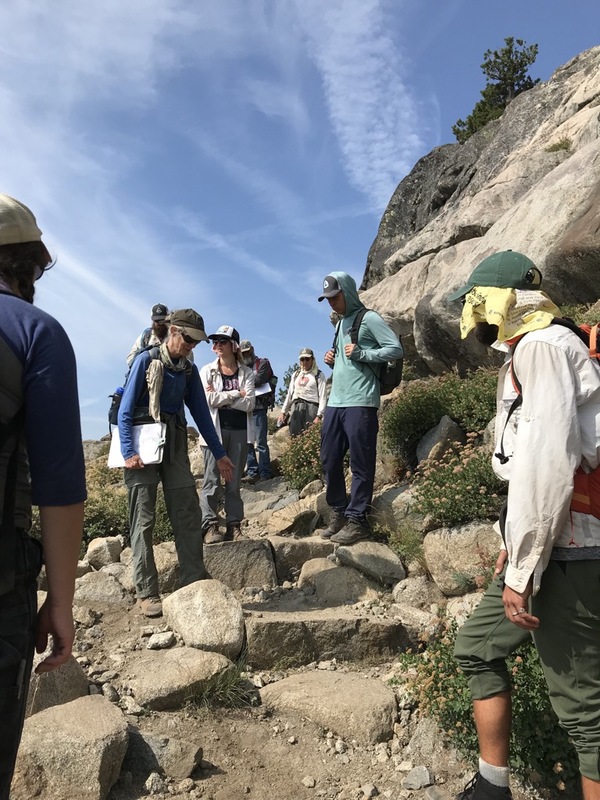 The 2018 Tahoe Trail Skills College was made possible thanks to the U.S. Forest Service and California Alpine Club. 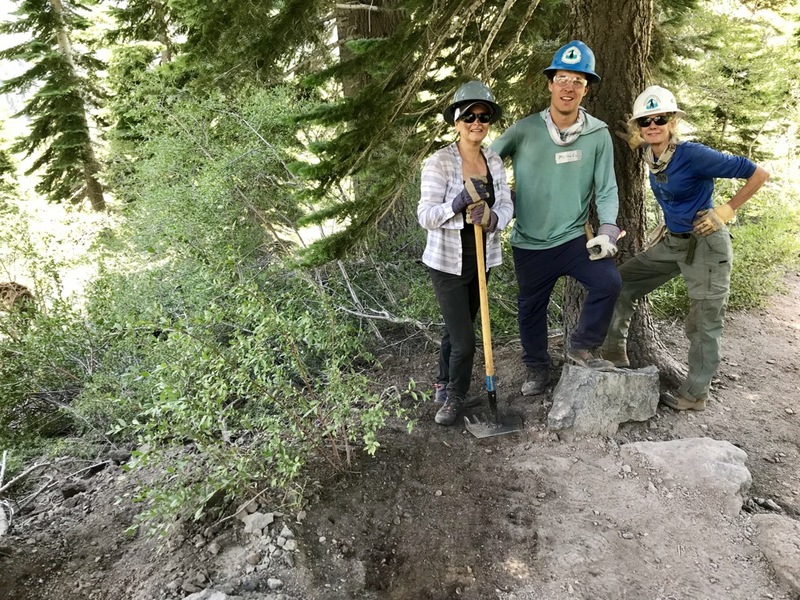 These sponsors and partners welcomed 55 volunteers to dig in the dirt and learn new skills in the Tahoe National Forest, Truckee Ranger District. 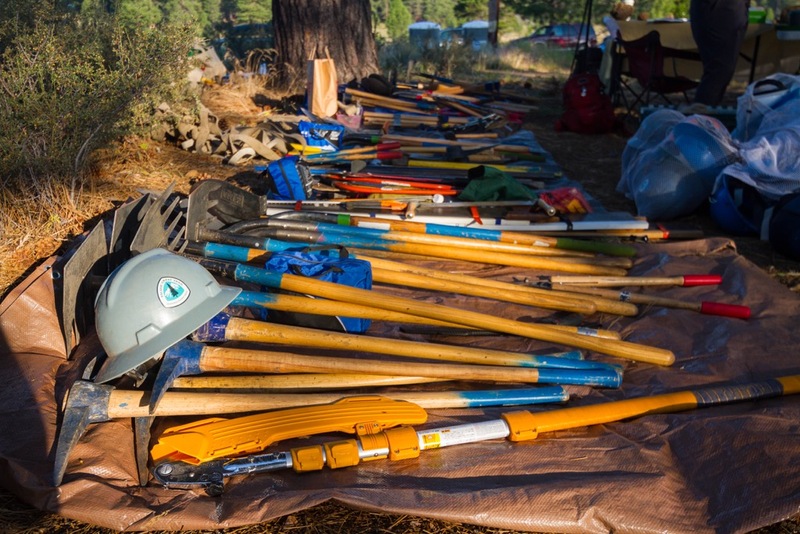 Learn moreabout Trail Skills College and PCTA volunteer opportunities. The view is much different now. So, this is what they meant by “trail eyes.” Photo by Spencer Dykstra. Donna Cline is PCTA's Donor Relations Coordinator.